Welcome to the web site of the Department of Louisiana of the Marine Corps League. Marine Corps League was incorporated by an act of Congress in 1937. It perpetuates the traditions and spirit of ALL Marines who proudly wear or who have worn the eagle, globe and anchor of the Corps. The mission of the League is to provide an organization where Marines can join together in camaraderie and fellowship for the purpose of preserving the traditions and promoting the interests of the United States Marine Corps. As part of this mission we render aid and assistance to all Marines and former Marines and to their widows and orphans. We also support the community they live in. The Detachments of this Department live up to these traditions by supporting Louisiana Marines and their families in their respective communities . This includes providing Funeral Honors for fallen Marines. They also help their communities by providing educational programs at local schools, participating in patriotic events, volunteering for community projects/events and supporting local charities. 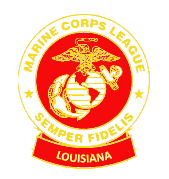 Members of the Marine Corps League in Louisana use this site to keep current with all information of interest to our state. Non-League visitors are welcome to browse our site pages to see what our detachments are involved in. If you are a MARINE or an FMF Navy Corpsman and considering membership in the Marine Corps League we invite you visit one of our Detachments. WE ARE ALWAYS LOOKING FOR A FEW GOOD MEN AND WOMEN to join our ranks. To become a Member you must have served honorably for at least 90 days. Your current status may be active, reserve, retired, or former active duty Marine or FMF Navy Corpsman. If you don't meet these criteria many Detachments will let you join as an Associate Member .